Puttin’ lipstick on a pig! A lil’ dab’ll do ya! My, the lengths we go to to justify behaving like the world. Do we understand the damage it does to us and to our children? Here is an invitation we received… followed by some thoughts. October 31, 2013 from 5:30 – 8:00 pm please join us at (redacted: A conservative church I once served in) for Reformation Celebration. Wear a costume if you like, but you are not required to wear one. If you choose to wear a costume please wear one that reflects the Reformation theme. If I recall ‘Reformation history,’ didn’t they cry ‘Sola Scriptura?’ So, what does Scripture say? “When the Lord your God cuts off before you the nations which you are going in to dispossess, and you dispossess them and dwell in their land, 30 beware that you are not ensnared to follow them, after they are destroyed before you, and that you do not inquire after their gods, saying, ‘How do these nations serve their gods, that I also may do likewise?’ 31 You shall not behave thus toward the Lord your God, for every abominable act which the Lord hates they have done for their gods; for they even burn their sons and daughters in the fire to their gods. I did, and that is nothing more than lipstick on the pig! Syncretism! Dressing up the profane in an effort to make it palatable. 17 “Therefore, come out from their midst and be separate,” says the Lord. 7 Therefore, having these promises, beloved, let us cleanse ourselves from all defilement of flesh and spirit, perfecting holiness in the fear of God. Do we not understand what ‘come out of Babylon‘ means? One of the great values in walking according to the ways of the Father, is learning to distinguish between the holy and the profane. His Word teaches, through daily distinguishing between clean and unclean, what is pleasing to Him and what is not. Mixing the profane (halloween or its likeness) with anything that professes to be holy (the people of God) does not in any way, shape, or form honor Him! He calls it an abomination. What does this teach our children? How does it affect their relationship with the Father? It teaches our children that God doesn’t really mean what He says. It teaches them that it is okay to participate in the things of the world as long as we put a little ‘Jesus’ paint on them. And then you are going to tell them that virginity and purity is what He desires? The ‘church’ has a history of dabbling in the world and practicing pagan ways while making excuses!! Christmas came applying ‘Jesus paint’ to the pagan holiday, Saturnalia. Lent came from dressing up the pig/pagan festival of mourning Tammuz. Easter is a fertility rite straight out of Ishtar worship. let us cleanse ourselves from all defilement of flesh and spirit, perfecting holiness in the fear of God. Yahweh tells us exactly how to be ‘holy.’ He is abundantly clear in His Word and He never changes His mind or alters the original commandments. I would encourage you to consider carefully the implications of playing patty-cake with the world! Put lipstick on the pig, but understand, it is still a PIG. Unclean is unclean and there is nothing you can do to make the pig clean! This entry was posted in A Thought... and tagged Apostle Paul, clean, Halloween, harvest fest, harvest festival, hay ride, Hebrew Roots, Martin Luther, pig, presbyterian church, profane, Reformation Day, reformed presbyterian, reformed theology, roman catholic, syncretism, Westminster Confession of Faith, Yahweh, Yeshua. Bookmark the permalink. 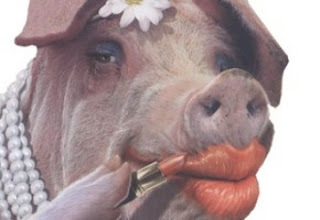 4 Responses to Puttin’ lipstick on a pig! A lil’ dab’ll do ya! My oh my! I hope you were able to pass this message on to the ones who sent you the invite. Hopefully someone will wake up to Truth. Amen!!! I never could stomach “harvest festivals” or Easter egg hunts…and I never took my child to any such things while he was growing up. We also didn’t attend services on Easter Sunday or Christmas. I’m sure many chalked it up to my being that crazy Jewish believer, but a few listened and pondered – including my son, who understands more about the religious/pagan origins of things than most. Thanks for sharing. That photo… 😀 Definitely grabs the attention. 😀 Good Word connected to it.